A new chip out of the University of Toronto detects RNA strands that indicate the presence of cancer. So there’s this period of time during a visit to the doctor’s when you’re left alone in the office. You just saw the nurse or PA, and the doctor is playing golf somewhere, so you have to wait in your little paper dress. I was once stranded in that limbo for an hour. Wouldn’t it be nice if that time could be put to good use? Researchers at the University of Toronto have developed a microchip that works with nano-materials to detect biomarkers associated with cancer. Bottom line, in about 30 minutes the new biosensor can determine if you’ve got the ‘Big C’. Having already been proven to work with prostate cancer, the device could one day even be adapted to detect HIV, or H1N1 swine flu. Now that’s a good use of my time. Development of the cancer biosensor was published in ACS, and more recently in Nature Nanotechnology. Shana Kelley, team leader for the project, says that the cancer detection microchip is the size of a fingertip. It and related electronics could fit into a hand held device the size of a Blackberry™. That means the detection of cancer would not only be much quicker (30 minutes vs. days of lab work) but it could be portable and relatively cheap as well. Hand held detection of major diseases and illnesses would revolutionize medicine, making it more accessible and more informative. The biosensor works by pairing three components: biological detectors, nanowires, and standard silicon chip technology. The biological detectors are attached to the end of nanowires (typically made of gold) and will bond to the biomarkers that indicate the presence of cancer. These biomarkers are strands of micro RNA or messenger RNA produced by the mutated genetics of cancer cells and so the biodetectors are called nucleic acid probes. 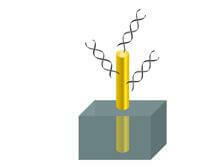 When the RNA interacts with the nucleic acid probes, electric currents are induced along the gold nanowire. These currents are detected and decoded by the silicon chip technology to determine if cancer is present in a sample. When RNA interacts with the nucleic probes attached to a gold nanowire, an electric current lets the chip know something has been detected. The method for collecting and processing the biological sample will depend on the cancer in question. The real trick advantage over traditional testing of these samples comes from working on the nanoscale. By increasing the number of nucleic acid probes, the rate of interaction between biomarkers and probes gets much quicker. This is how the biosensor can work in just 30 minutes. Kelley and her colleagues have created versions of the chip that are multiplexed – detect more than one thing at once. They could conceivably create a model of their device that detects all of the most prevalent forms of cancer at one time. If the combination of biological detectors, tiny wires, and integrated circuits seems familiar, it should. These same basic elements are what allowed for the creation of the oral cancer in spit detector, the bacteria biosensor, and the DNA Electronics genetic testing device. The lung cancer breathalyser works in a somewhat similar fashion but uses nanoparticles to detect chemicals rather than biomarkers. Collectively, these five devices (and many others we haven’t discussed yet) indicate that we are about to enter the age of ‘labs on a chip’. That is, the testing and detection processes that used to require days and entire laboratories of researchers are soon to replaced with fast acting biosensors that fit in the palms of our hands. Give these technologies five to ten years (or less in some cases), and I am certain that the trips to our doctors will change dramatically. Almost every important disease or illness will have an associated hand held biosensor chip associated with it. Infectious diseases like swine flu, or HIV, or even a bio-terrorist weapon? You’ll know what you have in minutes. Getting older and want to be tested for prostate, oral, lung, or breast cancer? It’ll be done while you wait. Access to quick and reliable information about our health is going to help us live longer and healthier so that we have more time to enjoy. You can even sit around in a paper dress if you get nostalgic.